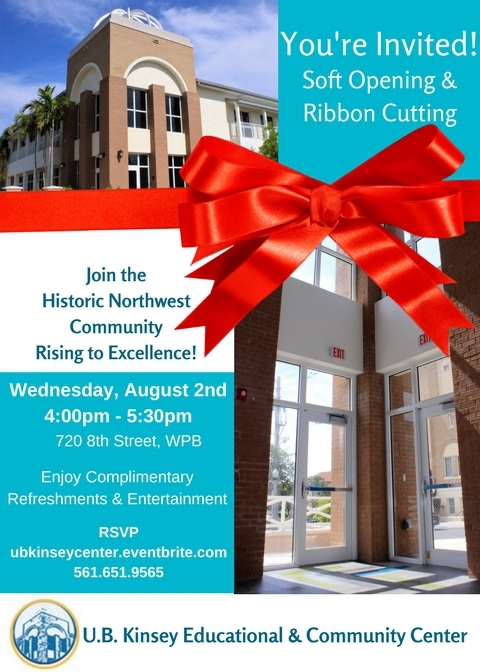 (West Palm Beach – July, 31 2017) – A ribbon-cutting for the U.B. Kinsey Educational & Community Center will be held at 720 8th Street in West Palm Beach on Wednesday, August 2, 2017, from 4:00 pm to 5:30 pm. “Rising to Excellence” is the completed $5 million Educational & Community Center near the Tabernacle Missionary Baptist Church. The 10,000-sq. ft., two-story Center replaces the former Tabernacle Learning Center, which was demolished in 2008. The church, located at 801 8th St., is the oldest African- American church in Palm Beach County and was the first to house a school for African-American students. The Center is named for the late UB Kinsey, a longtime Palm Beach educator who was a member of the church and will offer modern classrooms with up-to-date computers, a school library, afterschool youth tutorial, mentoring and senior programs, plus a large meeting room for civic meetings and a complete kitchen. “We are excited that the U.B. Kinsey Educational & Community Center will be another light upon the hill, bringing hope and the alleviation of suffering to a neighborhood that has long been neglected, says Reverand Gerald D. Kisner, pastor of the 124-year-old Tabernacle Missionary Baptist Church. We prayerfully envision a Center of hope with innovative programs and vital services that can bring about positive transformation in the lives of young people, adult and senior residents in the Northwest community, and beyond”. Construction was completed by D & D Constantakos Inc. of Jupiter and a generous contribution by North Palm Beach residents Jeff and Lynda Jacobs. The design of the building is compatible with the church, including a lighted dome. 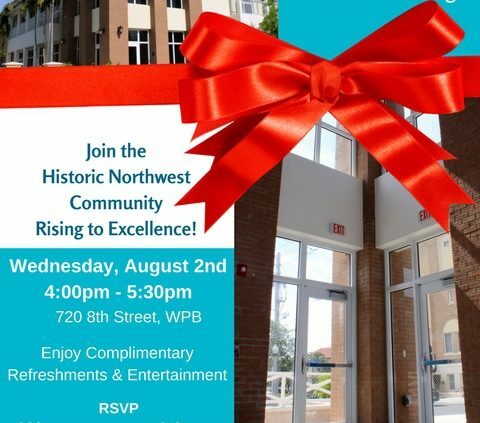 Attendees and media will get an exclusive first look at the new UB Kinsey Educational and Community Center, learn about the center’s programs and opportunities to donate and volunteer, and enjoy complimentary refreshments while touring the facility. To RSVP, visit https://ubkinseycenter.eventbrite.com, email events@upscalebymosaic.com or call 561.651.9565. For more information about U.B. Kinsey Educational and Community Center, visit www.tlcwpb.org or contact LaVoise Taylor Smith at 561.267.4929 or lavoise@msn.com.